The Diaries of a Glam Mama: Get 15% discount vouchers from H&M while doing some good for the world! 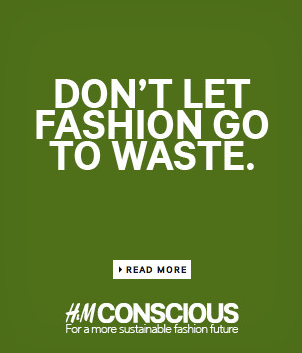 Get 15% discount vouchers from H&M while doing some good for the world! I was shopping in H&M recently and noticed these green boxes by the counter. I didn't know what they were about until I checked their website and found out that it was part of an awesome initiative by H&M where you get to give away old clothes in exchange for discount vouchers! H&M is doing this as part of their effort to reduce the amount of clothes that ends up in landfills, which is just fantastic. Collect clothes you want to give away. Bring a maximum of TWO shopping bags full of clothes of to H&M. Look for the big green box by the counter. Make sure you see someone at the counter with your bags. You will be given a 15% discount voucher for one item for each bag that you give. You will then likely go a little crazy wanting to try on at least a dozen outfits and will be told that you can only bring in 7 items into the changing room, and have intense arguments in your head about the virtues of distressed high-waisted shorts and its appropriateness for a woman your age. Or maybe that's just me, I don't know. Coincidentally, I've been spring-cleaning, so I had a bunch of clothes to give away. I've collected (and used! LOL) three vouchers already. And I have at least one more bag to send off sometime this week (one of the downsides of losing a lot of weight is that your clothes won't fit anymore. Hahaha look at me lying like it's a downside!). How many of you are running off to your closets right now? LOL. Make sure to check out the H&M website for more details! Solche Angebote nehme ich auch immer wieder gerne in Anspruch. Da kann man beim häufigen bestellen doch den ein oder anderen Euro einsparen. I dah ada 5 voucher dah skrg k, hahaha. Sila kemas2 baju anda skrg!